The old adage is that the road to hell is paved with good intentions. As Ben Graham said, it’s not the bad ideas that do you in, but the good ideas that go too far that can do the most damage. A perfect example of this was the drive for more Americans to own homes, whether they were prepared or not. We all know that one important aspect of the American Dream has been to own a home. Since World War II it would be hard to argue that this has not been extremely beneficial for society. On the other hand, homeownership is not right for everyone. Unfortunately, beginning in the late 1990s and carrying on to 2007, there was a huge societal, financial, and cultural push to raise the homeownership rate. How was this done? Easy lending as the following chart shows. Between 2002 and 2007 the total value of mortgages outstanding for 1 to 4 residences nearly doubled from approximately $6 trillion to nearly $12 trillion. This is what I’m calling The Lollapalooza Effect. So what were the ramifications of this easy credit for home purchases? An explosion in bad loans that became delinquent and ultimately non-performing. The delinquency rate went from approximately 2% in 2002 to 11% by 2010. Clearly, housing is on the mend, but only after horrific carnage had taken place. Declining home prices led to a very large percentage of those with mortgages having homes that were underwater (they owed more than their homes were worth). 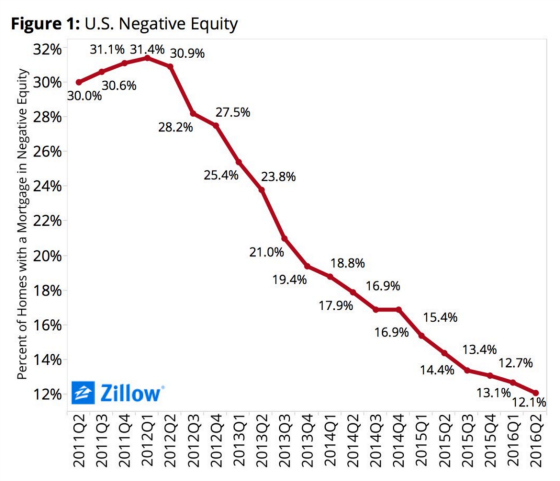 Fortunately, with rising home prices, restructured loans, and more equity required by lenders, far fewer homes have underwater mortgages. Despite the healing of the housing market, millions of people have had to exit homeownership through the loss of their homes and millions of others have not entered it because they cannot qualify for mortgages. There are also many others who prudently recognize that homeownership is not currently the best choice for them and would prefer the flexibility of renting and the much lower capital cost of not having to maintain a home. 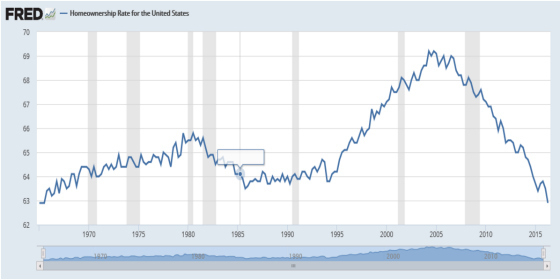 The result is that the homeownership rate has now dropped back down to levels not seen since the 1960s. 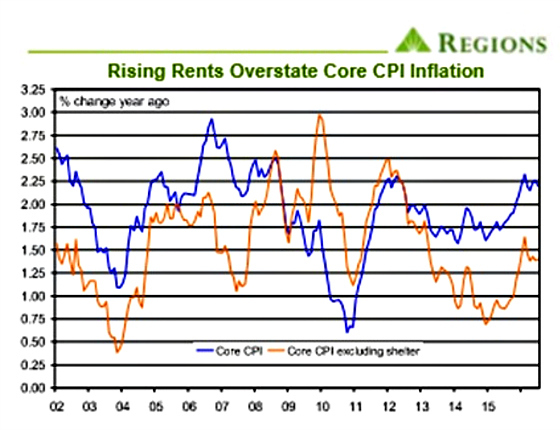 The converse of the chart above is that the rental rate has shot higher from approximately 31% in 2005 to 37% today, representing a 20% increase in the rental rate among households in the country. When a few different things come together in a way that creates a more powerful outcome than any one variable can on its own, Charlie Munger has called this the Lollapalooza Effect. This has been the case for owners of rental housing. According to the U.S. Census Bureau, the homeownership rate for households headed by someone 35 or younger peaked at 43.6% in 2004, although it hovered at around 43% through 2005. As of the second quarter of 2016, it has plummeted to 34.1%, representing a far greater drop than the overall decline in the homeownership rate. The youngest people, those who were most traditionally likely to rent, flocked to homeownership as credit standards loosened and capital became widely available for inexperienced borrowers. This put a huge dent in the demand for apartments. This has all changed, however, with the mortgage bubble bursting, the explosion in foreclosures, and much tighter credit standards coming as a result of the carnage. Let’s add one more ingredient to the mix to create the Lollapalooza Effect: Student loans. The following chart shows how these have exploded since 2006. In 10 years the total outstanding balance has gone from approximately $500 billion to over $1.3 trillion. 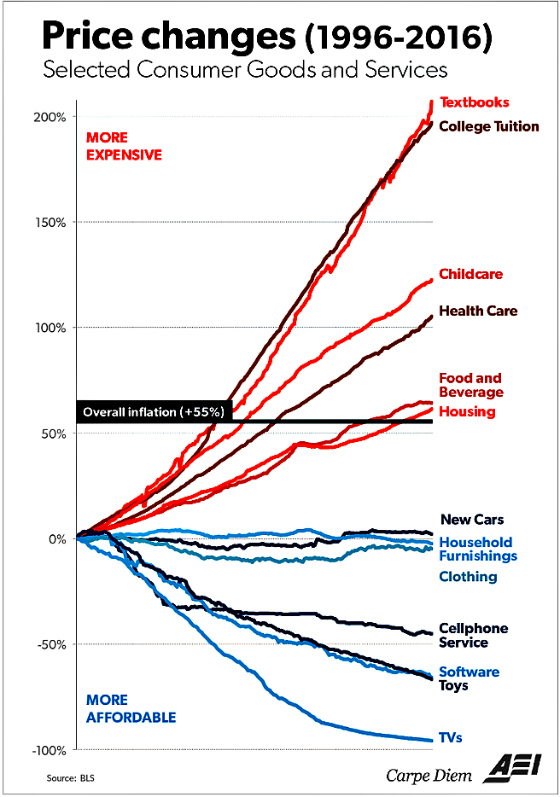 And just as subprime lending and the overall explosion in mortgage growth helped create a huge demand for housing and pushed prices higher, the same has been true for student loans, allowing for very dramatic increases in the cost of tuition as the following chart dramatically shows. Unlike higher education, retailers have been facing cataclysmic changes to their demand fundamentals with the advent of online shopping, and the beast known as Amazon. Competition is relentless and truly only the strongest can survive. This is very different from higher education which is often shielded from competition, particularly for the elite colleges, and have had tremendous pricing power and less of an incentive to focus on being more efficient and cost effective. 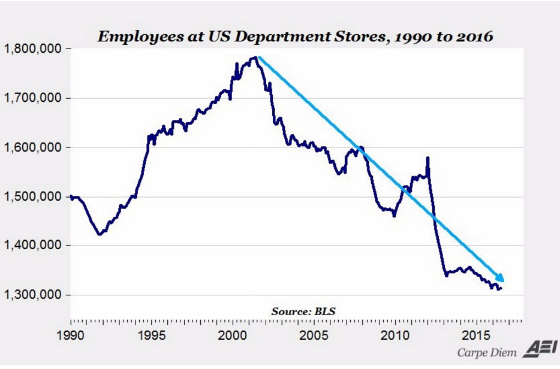 This is what has happened to department store employment as a result. This is not a pretty picture and is a dramatic depiction of what Schumpeter called creative destruction. 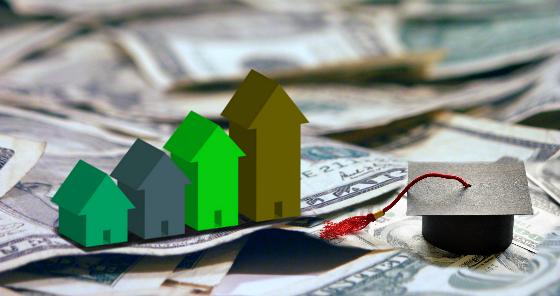 The pricing power of higher education fueled by easy credit may not be good for society but it has been quite beneficial to apartment owners. The Lollapalooza Effect has come about from the negative repercussions of the good intentions of opening up home ownership to the masses as well as higher education. This has left many people with debts they could not or may not be able to repay and assets that became impaired (homes) and the jury is still out as to whether there will be a sufficient return on the money borrowed for education. The end result is more people renting because of credit standards that have tightened, bruised credit and psyches, and student loans that can’t be discharged in bankruptcies and make it much more difficult for these individuals to qualify for mortgages. This has translated to pricing power for apartment owners and landlords as the following graph shows. 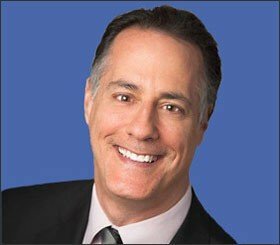 While apartment developers are building more rental units, we still feel that the demand for rental housing should remain strong as people come to value the flexibility of renting, the mortgage market remains relatively tight, and student loans continue to impede younger people from buying homes. The Lollapalooza Effect should remain in force. Do you agree? **Definition of Lollapalooza an extraordinary or unusual thing, person, or event; an exceptional example or instance.